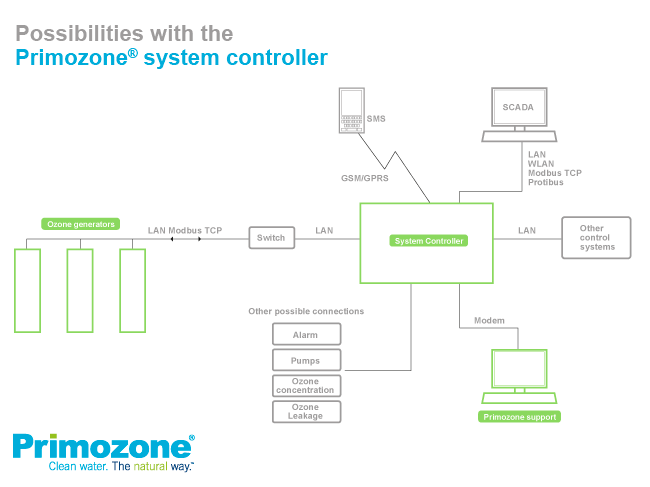 The Primozone® system controller is a sophisticated control unit that allows for safety, monitoring and control of the complete Primozone ozone water treatment system. The system controller can be connected to external control systems and is very flexible. With the Primozone system controller you can monitor and control up to five different ozone generators as standard. The amount of ozone needed may fluctuate over the year or even the day and with the Primozone system controller the ozone capacity will adjust proportionally. This automatic adjustment will save energy an thus keep the running cost for the entire ozone system at a low level.